NBA training camps have started. The Toronto Raptors are back on the court, getting into shape, working on their respective games, and of course, talking about the upcoming season. A bunch of new players are joining the team (which always seems to be the case), but this year there is some legitimate optimism. For one, the Raptors’s (I’m going to try really hard to avoid using first person pronouns in this piece) top pick from last year, Jonas Valacuinas, is going to play (wait, not yet, he’s injured), the team traded for a young player, Kyle Lowry, with legitimate potential to be very good on both sides of the ball, and, um, they got Landry Fields. 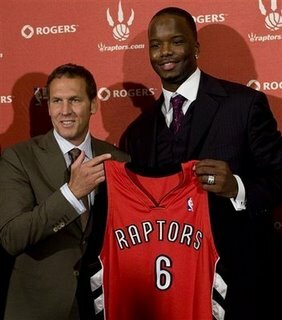 Toss in a new top 10 pick (Terrence Ross) and well, hope springs eternal. On Tuesday, the architect of the 2012-2013 Toronto Raptors, the builder of the team since the 2006-2007 season, Bryan Colangelo was quoted by the Toronto Star as saying “There’s that feeling there could be something special about this group but time will tell”. If you are wondering, he has said similar things before. Yes, we are in Year Seven of Colangelo’s Raptors reclamation project and despite a strong showing (in the regular season anyway) in 2007 with a division title, the team has yet to build on that storied 2000-2002 period where it seemed anything was possible (well, maybe a trip to the Conference Finals, anyway). This column, however, will not be another dog-pile on Colangelo. In fact, while many pundits and fans are quick to blame Colangelo for all of the team’s failings, I’d like to make the case that over the last few years, despite a couple of missteps, he has actually done about as well as could be expected for the lone Canadian team in the NBA; a team owned, lest we forget, by an organization that also owns this team. Yes, I am defending Bryan Colangelo. A potential saviour for the Raptors? Let’s take a trip back to 2006. The season has ended and Bryan Colangelo surveys the damage inflicted by two years of the aforementioned Babcock (damage is truly not a strong enough word). He has perhaps one main asset, Chris Bosh, and a roster full of question marks (and Antonio Davis, still!). Colangelo is tasked with rebuilding the franchise and his initial off-season moves, transactions that will define his entire run as GM, are based on equal parts luck and controversy. First, the luck: the Raptors win the #1 draft pick for the 2006-07 season, selecting the enigmatic Italian Andrea Bargnani. The controversy? Trading burgeoning rookie forward Charlie Villanueva (having once scored 48 points in a game) for a tiny point guard with a history of back problems named TJ Ford. It was a risky play and Colangelo was taking a bold stance. The Raptors had need of a point guard, they had an asset they could sell at a relatively high value, and they could move before, perhaps, a positional clash between Bosh and Villanueva could occur (or, you know, before this). 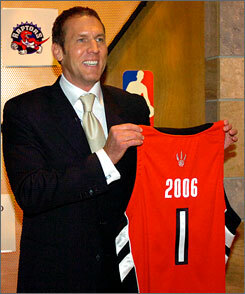 In an amazing turn of events, the Raptors of 2006-2007, Colangelo’s first full year, went on to win 47 games and the Atlantic division title. Led by the solid Chris Bosh, the explosive TJ Ford, the out of nowhere (re: possibly lucky, but who can say) likes of Jose Calderon and Jorge Garbajosa, and nice additions like Anthony Parker and Rasho Nesterovic, the Raptors showed tons of potential before getting romped out of the playoffs by Jason Kidd in full on aggro mode (with Vince Carter in tow. That one still hurts). The following year, with some more small moves (hello Carlos Delfino! ), the Raptors clawed into the playoffs again only to be embarrassed by the Dwight Howard-led Orlando Magic. It was a valuable lesson for the team, but unfortunately, and here’s where Colangelo’s legacy gets tricky, the wrong lesson was learned. Overlooking their tremendously weak division in 2006-07 (the Nets, a shadow of their 2002-03 heyday were the only other playoff calibre team at the time) and the general downward slope of the team’s fortunes (alas, Garbo, we hardly knew ye), Colangelo smelled playoffs, the second round, the sky was the limit! He made what I contend to be his only unfixable error: he traded, principally, TJ Ford (someone who, by that point, definitely had to go) and the 17th pick that year for the forever injured, 30 going on 73, Jermaine O’Neal. His destiny for next season was set, it was playoffs, the second round at least, or bust. Jermaine O’Neal: Putting all of your eggs in one basket. Or on one knee. Sadly, it was a bust. But, despite the teams failings and scrambling mid-season corrective trades (trading O’Neal for Shawn Marion), the Raptors managed to escape one fractious point guard situation (Ford vs. Calderon), they moved two aging probably unhappy veterans (O’Neal went on to be injured for more teams, Marion fled and eventually helped Dallas win a title), and ended up with some cap space relief. The O’Neal gambit turned out to be a failure, and while Colangelo worked (some would say flailed) to right the ship, the Raptors played on. It is no secret, after watching every high profile player leave the team, to know that the Raptors have limited chances of signing marquee free agents. The bid for Hedo Turkoglu was seen as a big win for the organization on some level purely because it had happened at all. In reality, Colangelo has to work in that hazy middle ground of the NBA, signing guys like Jarrett Jack, turning unfortunately dead players like Turkoglu into usable pieces like Leandro Barbosa, coveting draft picks, however high, like manna from heaven. To that last regard it should be noted, the only true draft pick mistake Colangelo ever made was the pick he didn’t keep. The 17th pick that was tossed into the Ford/O’Neal deal? Roy Hibbert. The legit 7 foot centre currently being touted as the key to the Indiana Pacers playoff and NBA title aspirations. Like I said, a little controversy, and maybe some bad luck. But really, Bosh just wanted more people to see him on TV. 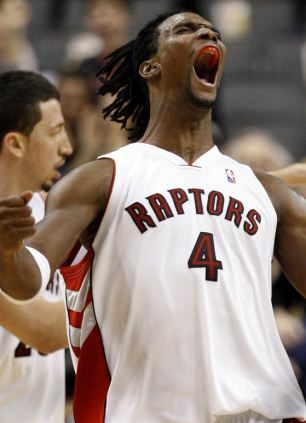 I admit that the last couple of years, post-Bosh, have been uninspired. Colangelo has been mostly stuck with draft picks in the 9 to 12 range, excepting his top 5 pick two years ago (used on Valacuinas). The case could be made that the Raptors need to really bottom out, get down to Charlotte Bobcat levels of awfulness, to snag a top 3 pick and ride it (err, I mean, him) for as long as they can. Yes, that top 3 pick could be another Carter or Bosh, out the door after 4-5 years, or it could be a Kevin Durant, someone who grows with the team, builds something special and becomes known across the country. Alternatively, while the team remains somewhat moribund, Colangelo continues buzzing. He keeps wheeling and dealing, turning dead weight into players, however valueless. He conjured Lowry essentially out of thin air; he managed to extricate himself from that disastrous Turkoglu signing when it was clear that Hedo had other things on his mind; he survived another star player leaving the team with minimal egg on his face (if anything, Bosh came off looking worse). I believe he has been trying to do the right thing; assembling young talent to grow together; managing the team’s cap space as wisely as possible (OK, some guys remain overpaid); hiring affable, yet hard-nosed coaches for support; and, generally course correcting as quickly as possible. Colangelo can’t play the games for the players (think of the damage that would do to his custom tailored dress shirts!) but he’s done a respectable job in what amounts to the NBA wilderness. Remember, as mediocre and unremarkable as things have been for the Raptors these last five years, they could always be worse. He was hired mid-year in 2006 after the Raptors organization finally woke up and fired Rob Babcock. And as an added bonus, Colangelo somehow managed to flip Rafael Araujo (high on the Top 10 list of all time worst draft picks) for Kris Humphries (definitely a serviceable, if moderately delusional, big man). I contend that Sam Mitchell would have been fired far sooner had he not been comically handed the Coach of the Year award in 2007. He really should shake out of his Euro fixation. Lowry is a good start. The issue hasn’t been where a player is from, but who this team has picked. I want Jose Calderon to be traded, but only because the team is getting younger and he isn’t. It’s all well and good to say that he should shake his Euro fixation, but feel free to point some Americans in our direction who wouldn’t rather play somewhere warmer and closer to home. If we had better basketball culture in THIS country, the result would be the same: everyone wants to go to LA or Miami and get laid on the beach. Well, not so much the basketball culture, but Americans’ perception of Toronto as a basketball home is improving; slowly but surely. So there is some hope. Not everyone is concerned with their Q score as much as winning. Amir Johnson for one seems to love being in Toronto, and he’s actually both productive and one of the better players on the team. Basketball culture in this country has to do with the growth of the sport across the country on all levels. The talent from Canada is skilled but also improving in strength and conditioning (search AAU and Ontario Basketball in the same engine). However, we aren’t talking about basketball culture in this case, we’re talking about a better Raptors culture. Raptors fans shouldn’t be mistaken for passionate basketball fans anyway. Love and appreciation for the sport will be felt on all levels from grassroots to the pros, they do not skip or neglect the “little” things that make a big difference like Grassroots Canada, Phase1 Basketball, All-Canada Classic, and the National Basketball League of Canada. I think that many fans across Canada, especially in this market love the Raptors but are only interested in winning at all costs with none in the long-term process required to become a sustainable powerhouse. Good read Daniel. I agree with a lot of things you said, especially the coach of the year endnote about sam mitchell. I think the Raptors are in a good place for next season. Despite some issues, I really like Bargnani. Last season, before he went down with his injuries he was 5th in the league in scoring for a while and the Raptors were winning. His issue is he doesn’t play well enough like a center considering how big he is. He could be a more assertive force, but he doesn’t play that way. He never rotates or plays help defense. He forgets that he’s the last line of defense, but apparently Casey is working on that and his communication on court, and despite what many believe, Bargnani is actually a good 1 on 1 defender. If he can stay healthy we’ve got about 25 pts a night accounted for. I think Jonas will take a little while to learn the ropes, but he will be decently effective from the get-go. I predict he’ll be in foul trouble a lot in the first half of the season though. I’m really looking forward to seeing Lowry, DeRozan and Ross getting to work. I’m predicting the Raptors as the 8th seed in the east this year. God I hope they stay relatively healthy.